I’m so excited that we’re having our Halloween Party again this year! Last year’s was a blast and I am already starting preparations. I sent out a save the date in the beginning of September, but now it’s time to send out the actual invitations. I am not an evite kind of girl. (Not that there’s anything wrong with that, I just enjoy making the real deal.) Click here to see similar ones that I made last year. Here are two simple ways to make invitations… without expensive stamps, inks, cutters or other supplies. First, I created a simple Word document. Orient your page to landscape, go to format and create 3 columns. Type up your party details and select a cute font. I inserted a cool skull that I got from The Graphics Fairy. Copy and paste two times so that your invitation fits 3 times on the page. I had already cut the invitations apart before I decided to do a blog post, so no pictures. I’m sure you get it though. My printer is on the fritz, so I saved my Word document as a PDF file and emailed it to my local FedEx-Kinkos. I placed an order for them to run 15 copies of this on plain white card-stock. The total was $5 and it gives me 45 invitations. I was able to pick them up at the store and use their paper cutter to quickly cut them into thirds. I took an old (and mostly dried up) ink pad and inked the edges of the paper. Because the ink pad was a bit dry, I took a black marker and “re-inked” the pad. Worked well enough for what I was going for, which was a dirty, smear-y look for the edges. My next step was to take a dark card-stock and make a tri-fold in it. Easy. Don’t worry about precision or cutting. As long as it fits in a standard envelope, you’re good to go. It looked a little too plain in there, so I took some fabulous copper colored, cobweb looking ribbon and taped that to the back of the card. In order to economize, I cut the ribbon in half length-wise for the sides. Better! It needed a little something. Then you know what happened…? I ran out of the cute copper ribbon and the store didn’t have any more. 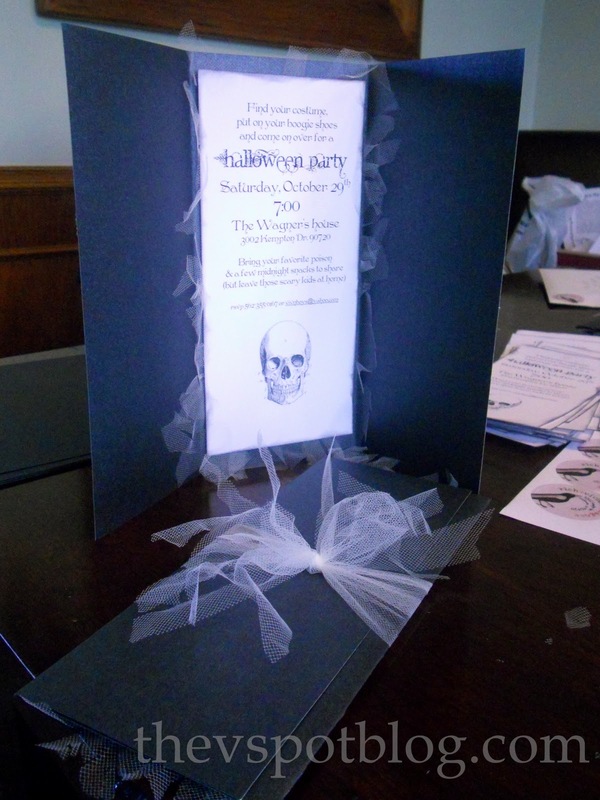 What’s a girl to do when she’s making Halloween invitations and runs out of something…? If she’s me, she looks in her wedding/spring type party supplies. She finds white tulle. hmm. I actually ended up liking how the white tulle looked more than I liked my original idea. So I did two versions. I taped strips of the tulle to the back of the card just like the ribbon, but then I took scissors and sliced it up and frayed it. These cute address labels are from Bohtieque Design. So there you have it, these invitations are super easy to make and they are super inexpensive as well. They work out to about 43 cents a piece. Not too shabby! These are great! Really cool address label! Love the handmade feel and the materials are not crazy expensive. Love a good Gypsy as costume suggestion. LOOOVE them, looks really cool! I’m in love with this invites, they are fabulous. I’m all for the real deal. Those are awesome! When my girls are older & I have more me time I am SOOOO going to start throwing adult parties!!! SO FUN!!! So cute! Now, why did you go an x out your address? Can’t I come too? I would like to come to your Halloween party. I would also request that you make me some cool invitations to Emma Kate’s 2nd bday party! You are uber talented! Is uber a word? It’s underlined in red. DANG IT. And I’m still drinking. Going home tomorrow. BOO. When should I be expecting my invitation? I really love the thought and detail you put into things. This invitation is great! Ummm these are awesome. Every year we host a party and every year I want to make my own invites but run out of time. 🙁 Maybe next year! how cool! I love all of the little details you added to them. Those would have cost a fortune if you had them made for you!! They look awesome – so what are you going as this year? We were invited to an adult party and are thinking of going as Clive & Daphne (Phil & Claire’s alter egos) from Modern Family – lame huh??? Great tutorial and pattern! thanks for sharing.